Low E glass, E stands for emissivity, was introduced in 1979. Low-E glass works by reflecting heat back to its source. It does this by utilizing an ultra thin metallic coating on or in the glass. Low e-windows selection is based on location and climate of the facility, as well as the building design and window position. They can be used in new construction or major renovation projects, particularly in health care facilities. Their main environmental contribution is that they will provide with 30 to 50 percent reduction in energy use. Other benefits are long-term operating efficiency, improved access to daylight and natural views for occupants without increasing energy costs for heating and cooling. Low E windows are a critical part of the building envelope and provide considerable aesthetic value to building occupants by introducing natural light and providing a visual connection to the outside environment. However, windows can also represent a large source of heat gain or loss. Unmanaged solar energy can increase the heating load of the building, demanding more of the air conditioning systems. Similarly, windows with a poor ability to keep heat in allow warm air to escape the building in the winter, increasing the demands on heating systems. U-Factor measures how well a product prevents heat from escaping a home or building. U-Factor ratings generally fall between 0.20 and 1.20 with lower numbers indicating a product better at keeping heat in. Solar Heat Gain Coefficient (SHGC) measures how well a product blocks heat from the sun from entering the building. SHGC is expressed as a number between 0 and 1, with a lower SHGC indicating a product that is better at blocking unwanted heat gain. Visible Transmittance (VT) measures how much light comes through a product. VT is expressed as a number between 0 and 1 with a higher VT indicating a higher potential for daylighting. Air Leakage (AL) measures how much outside air comes into a home or building through a product. AL rates typically fall in a range between 0.1 and 0.3 with a lower AL indicating a product that is better at keeping air out. Condensation Resistance (CR) measures how well a product resists the formation of condensation. CR is expressed as a number between 1 and 100 with a higher CR indicating a product better able to resist condensation. More so than other green building strategies, Low-e window selection must be tailored to the local climate of a facility and building orientation. For example, facilities in warmer climates should install windows with a lower SHGC and those in a cooler climate should install windows with a lower U-factor. Low-e windows can be applied in different ways specific to local climates and heating and cooling needs. Low-e coatings applied to exterior window panes prevent heat gains from exterior radiation; whereas Low-E coatings applied to interior windows prevent heat loss. Manufacturers often offer several Low-E coatings with varying degrees of solar gain. You can choose to use either Low-E windows or Argon gas windows, but be aware that any one of these options will add cost to your project. The actual cost increase of using these type of window will vary depending on the model and type of shape used. 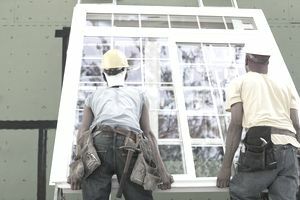 Normally they will add between 10-15% to the actual cost of a traditional window. There is always the option of applying Low-E films to the existing windows, but this solution starts at about $0.75 per square foot. Windows manufactured with Low-E coatings typically cost about 10 to 15 percent more than regular windows, but they reduce energy loss by as much as 30 to 50 percent. Furthermore, this improvement in the building envelope—particularly when coupled with other strategies that improve the efficiency of the building envelope—ultimately impacts the demands of building HVAC systems. These benefits should be included in evaluating the lifecycle costs of installing efficient windows. Efficient windows are defined by the climate of the building in which they will be installed. Engineers and vendors are able to make recommendations based on local climate and building orientation. Efficiency improvements to the building envelope directly impact the heating and cooling needs of the building; therefore, HVAC systems should be adjusted accordingly to account for decreased demands on the systems.